Timothy Dudley-Smith is arguably best known for his two volume biography of John Stott, but this hymn - which we sang yesterday at St. Matthew's for Remembrance Sunday - struck a chord. we bring our thanks for all our yesterdays. we bring our thanks for this the present hour. we bring our thanks for all that is to be. Well our friends at Pittsburgh's Church of the Incarnation are up and running, having been been received at the 2012 diocesan convention as a Mission Fellowship-in-Formation. They even have a nice new website. If you're looking for something a little different from standard ACNA fare, this may be one to check out. May they continue to prosper! This is a most unlikely sentiment from a Fabian like Edith Nesbit, but it's remarkably apt (and I never noticed it when I first read The Railway Children). Don't you think it's rather nice to think that we're in a book that God's writing? If I were writing the book, I might make mistakes. But God knows how to make the story end just right - in the way that's best for us." "Do you really believe that Mother?" Peter asked quietly. "Yes," she said, "I do believe it - almost always - except when I'm so sad that I can't believe anything. But even when I can't believe it, I know it's true - and I try to believe. You don't know how I try, Peter." From Owen Chadwick's magisterial The Victorian Church Vol. 1 (1966), 300. Manning and Newman were contrasting types and leaders of Anglicans attracted towards Rome. Newman was a divine, Manning a churchman. Newman looked for theological truth and found it in that church which, he came to believe, represented with least unfaithfulness the doctrine and ethos of the first Christian centuries. Manning knew that the church possessed the truth, but the English establishment allowed the state to adulterate the possession. Newman left the Church of England because it spoke to his conscience with stammering lips. Manning left the Church of England because it let a non-Christian state within its borders and surrendered its guardianship of truth to state officers. Newman left the Anglicans because they were Protestants, Manning because they were established. Together with my co-editors, Mary Beth Fraser Connolly and Christopher Denny, I am pleased to announce that Fordham University Press will be publishing our Empowering the People of God: Catholic Action before and after Vatican II. Composed of eleven essays dealing with a wide range of topics ranging from the Catholic Club of New York City and postwar Italian-American Catholic Action to the Extension Lay Volunteers and the National Council of Catholic Women, our volume has already received very positive feedback from the readers assigned by Fordham. As one born in the north of England, I blush to admit that I have never visited the see city of the northern Province of the Church of England. Since it so happens that General Synod was meeting here this weekend and two of my collaborators - Kevin Ward and Mark Chapman - on a forthcoming study of the Kikuyu Conference of 1913 (in its day an affair whose ecclesiogical implications looked set to be as far reaching as the election of Gene Robinson in 2003) were to be in town, Jennifer and I decided to meet up with them. Here's a view from the city walls - champion sight, as any good Yorkshireman would exclaim. 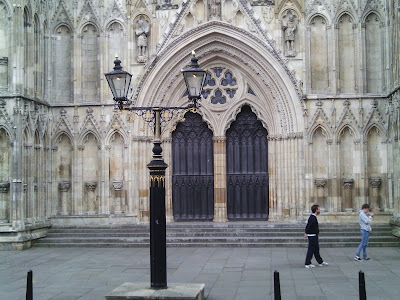 Approaching Yorkminster Cathedral. A nice day (no rain) meant that hordes of tourists were about. The west doors of the Cathedral. We arrived too late for morning service but returned for choral evensong, which celebrated the 800th anniversary of the awarding of a city charter by King John (three years later that unfortunate monarch had more pressing concerns at Runnymede, so perhaps it was as well that the burghers of York got to him when they did). Well there's a surprise; a soon-to-be ex-Archbishop of Canterbury and one of his possible successors. In the shadow of Archbishop Sentamu's cathedra, St Michael Le Belfrey upholds the banner of Evangelicalism. 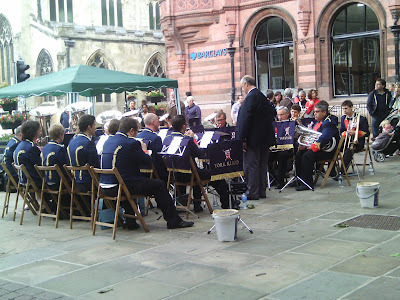 On a lighter note, this band made a joyful noise as we took a stroll through the town in the early afternoon. Photographs: Jennifer Bonner (who wisely persuaded me - against my better judgment - that it was time we acquired a digital camera). Greetings on a cloudy Wednesday from the City of Sheffield, where we are now in our second week of residence. Until today the weather has been gorgeous (a little too hot for me, but Jennifer was loving it). The city has some curious similarities with Pittsburgh - a now departed steel industry that has given way to various high tech enterprises (of which Jennifer's employer is one), a gritty working-class culture, friendly and helpful inhabitants - but it is obviously not identical. For one thing, there is a tram system that - unlike Pittsburgh's T - actually serves most of the city neighborhoods. If all goes well, come Friday we will have a rented house in Norfolk Park, about fifteen minutes from the railway station and the tram and about twenty-five minutes from Jennifer's workplace. On Pentecost we worshiped at the Cathedral of St. Peter and St. Paul, a handsome pro-cathedral with an excellent choir and a sizable staff. I met on Monday with a worthy Canon to discuss where I might be of most use (since Bishop Steven had suggested we worship there until we had a residence) and got the distinct impression he was a little worried lest my ACNA fundamentalism disturb the present modus vivendi! Interestingly, as far as he was concerned, ACNA was no longer part of the Anglican Communion, but beyond pointing out why they consider themselves so to be, I didn't belabor the point. He did observe that most churches in Sheffield - whether Evangelical, Catholic or Liberal - had a fairly clear identity, except for the Cathedral itself, which strove to uphold a more generic via media. I suspect that we may go and at least try out St. Matthew's, Carver Street, which is currently under one of the flying bishops. It will be a change to get some genuinely catholic liturgy again. Doubtless there will be more posted here once we get settled. It's very strange to be back in the UK after twenty years, as strange for me as it is for Jennifer. There must be more of the Ishmaelite in me than I imagined. Modern Church has kindly provided a comprehensive listing of how the diocesan synods voted on the Anglican Covenant. Dioceses in red opposed the Covenant, Dioceses in blue supported it, and Dioceses in yellow were divided. Some preliminary conclusions on the above. 1. 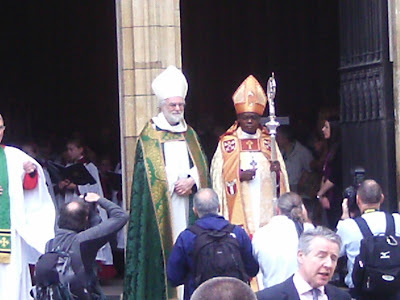 The English episcopate did its best to support the Archbishop of Canterbury. Of the forty-one dioceses listed, only four (Derby, Lincoln, Liverpool and Bath and Wells) saw the episcopal bench fully arrayed against the Covenant, while another eight reported a divided house. In three dioceses (Worcester, Rochester and St. Albans), bishops promoting the Covenant faced off against strong opposition among both the clergy and the laity. 2. 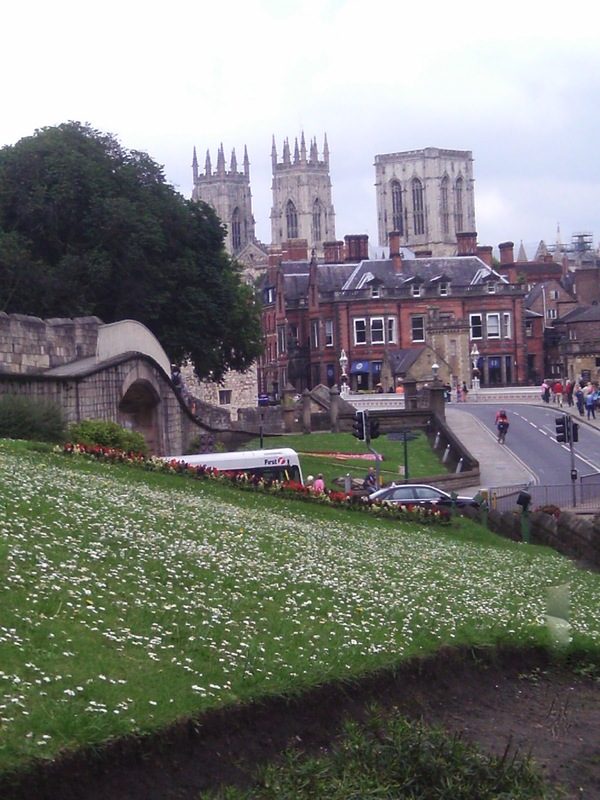 The Province of York has shown itself much more disposed to support the Covenant than the Province of Canterbury. In the former, eight dioceses have voted in favor and only four against (two others were divided); in the latter, nine dioceses have voted in favor and thirteen against (with another six divided). 3. There are some very decided regional clusters, both supporting and opposing the Covenant. Northwest England has five pro-Covenant dioceses (Blackburn, Bradford, Carlisle, Chester and Sheffield), while the Southwest offers a similar anti-Covenant posture (Bath and Wells, Gloucester, Salisbury, Truro and Worcester). The Southeast, by contrasts, boasts half of the divided dioceses, including such significant players as Ely, Chelmsford, Guildford and Oxford. 4. The individual figures point to persistent tensions at the diocesan level. Extremes such as the lay vote of 93% in favor of the Covenant in Coventry or the clergy vote of 87% against the Covenant in Derby are not the norm. Chelmsford (where the episcopal delegation was split) and Hereford are both dioceses that are clearly on a knife edge, but note also the lay vote of 40% in favor of the Covenant in that bastion of South Bank theology, the Diocese of Southwark. By the same token, the strong anti-Covenant vote in Michael Nazir-Ali's former diocese of Rochester is, on the face of it, perplexing. In Guildford, Leicester and Oxford, the clergy appear to oppose the Covenant and the laypeople appear to support it, which should make for some interesting conversations over the next few months. 5. All in all, it looks as if the Church of England is pretty much evenly split between pro-Covenant and anti-Covenant dioceses. That is not a recipe for harmony. The unraveling that began in 1998 looks set to continue and my fellow countrymen had better prepare for what their American counterparts went through in the 2000s. It isn't going to be pretty. 6. Both London and Manchester have now voted and reveal the same pattern of strong clergy opposition and slightly weaker lay opposition. I know too little about Manchester to have had any expectations, but the vote in London surprised me, not least the breaking of episcopal ranks on the part of one of Bishop Chartres' diocesans. Compared with Southwark, the pro-Covenant vote was eight points higher among the clergy but only two points higher among the laity. 7. Southwell & Nottingham and Chichester have both broken heavily in favor of the Covenant. It may be a largely academic exercise at this point, but it confirms the strong pro-Covenant stance in northern England. If Newcastle and York follow suit, it will present some interesting questions about the future of the Church of England. 8. 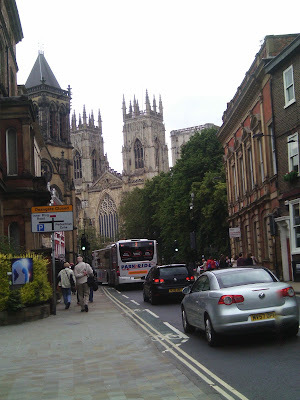 A resounding vote in support of the Covenant in York (far greater than in Canterbury) and - perhaps surprisingly - a defeat in Newcastle. The lay vote in Newcastle was very close (testimony, one assumes to the Evangelical presence), but more than two-thirds of the clergy rejected it. Remarkable how things happen when you go out of town! First, Christian Solidarity International publishes a letter by Pastor Yousef Nadarkhani, under sentence of death for apostasy in Iran. Food for thought, especially as to the quality of our own faith. Let us remember that beyond beautiful or painful feelings, only three things remain: Faith, Hope and Love. It is important for believers to make sure which kind of Faith, Hope and Love will remain. Only what we receive according the Word remains forever. I would encourage you to live in a way that is worthy to the Holy calling of the Word. Let believers, who are heirs of the glory, be examples for others in order to be a witness of the power of Christ for the world and the future. I beg you to live according the Word of God in order to chase the powers of darkness that generates doubts in your heart. The overcoming faith that casts out the doubt comes by hearing the Word of God. Then, the Archbishop of Canterbury announces his resignation. From Westcott House and Clare, to Magdalen College, Cambridge; one can't help wondering if he now wishes he had made that journey directly, without an archepiscopal intermission. Finally, my wife and I are headed for Sheffield, England, where she has just accepted a job as a research scientist. From the Steel City of Pittsburgh to the Steel City of Sheffield (though in both cities steel is now more a function of historical memory than economic reality). And from the Anglican Diocese of Pittsburgh to the Diocese of Sheffield, whose diocesan, Steven Croft, is also a former master of Cranmer Hall (Durham's theological college for those of an Evangelical disposition). Fifty years ago, my mother taught here in the German department; it will be interesting for the next generation to make a return. To my mind, Mary Renault remains one of the finest novelists of the classical period of Greek Civilization and The Last of the Wine, set during the dying days of the Peloponnesian War, when the hubris of Athenian expansionism was broken by Sparta and her allies, is perhaps the greatest of her literary endeavors. In this excerpt, Alexias, the narrator, and his comrade and lover Lysis, in service on the island of Samos, ponder the justice of the Athenian cause and Lysis recalls the influence upon him of Perikles' famous Funeral Oration, delivered in 431 BC. He turned the wine-cup in his hand. The black of his eyes, which had been wide open, grew small from looking at the flame, and the iris pleated, like grey and brown silk catching the light. "They held an Epitaphion at Athens," he said, "in the first year of the war, in honor of the fallen. The ashes and the offerings were carried in state along the Sacred Way, with an empty bier for the bodies that were lost. It was only a few months before your birth; perhaps your mother carried you in procession. I was seven years old. I stood with my father in the Street of Tombs; it was cold and I wanted to run off and play. I stared at the high wooden rostrum they had built for Perikles, waiting for him to climb it, as children wait for a show. When he appeared, I admired his dignity and his fine helmet; and the first sound of his voice struck a kind of thrill upon my ear. But soon I grew tired of standing with cold hands and feet, and doing nothing; I thought it would never end; the weeping of the women had disturbed me, and now the people listened in so deep a silence that I was oppressed by it. I stood staring at the gravestone of a lad carved with his horse; I can see it to this day. I was glad when it was over, and if you had asked me a year later to quote the speech of Perikles, I doubt if I could have fished you up a dozen words. So before I left, I looked it up in the archives. And there were the thoughts that I had supposed I owed to no one. While I read, I still could not remember hearing Perikles say these things. My soul seemed to remember them, as Sokrates says we remember music and mathematics, from the days when we were unborn and pure." I told him I had heard of the speech but never read it; and he quoted me as much of it as he could remember. Since then I have read it many times. But since I never knew Perikles, to me it is always Lysis who is speaking; I see not the tomb and the rostrum, but the lamps of Samos through a doorway, his shadow thrown big upon the wall, the piled armour shining beside the pallet, the black glossy wine-cup, and his hand, with an old ring of plaited gold on it, touching the stem. From: Mary Renault, The Last of the Wine (New York: Vintage Books, 1973; orig. pub. 1956), 271-273. Today, our household complement of PhDs doubled, after my wife, Jennifer Bonner, successfully defended her doctoral dissertation, entitled INTESTINAL DRUG ABSORPTION, CYTOCHROME P450 3A-MEDIATED METABOLISM, AND TRANSPORT AFTER SMALL BOWEL TRANSPLANTATION at the University of Pittsburgh. Words cannot do justice to the toil, tears and sweat that went into this endeavor, but, having watched its seven-year gestation, I can attest to the toll that it has taken. Through it all, my wife has constantly kept in mind that her work is ultimately intended to serve the patients whom she studied and their successors. I merely write history, my wife (in company with a great crowd of physicians, nurses, pharmacists and other hospital personnel) helps provide the sick with more opportunities to make their own. Author's Note: This report is written primarily to assist members of Trinity Cathedral in working through our recent crisis. The author will entertain comments here, but gives fair warning that purely pejorative observations regarding members of Trinity - or the leadership of ACNA or TEC - will be unceremoniously deleted. While he has no control over comments at sites that may link to this post, he requests that commentators at other sites observe the same courtesy. A related thread of interest may be found here. January 7 Update: See Lionel Deimel's response. On Thursday December 15, the Chapter of Pittsburgh’s Trinity Cathedral adopted a motion to reaffirm the charter of incorporation adopted in 1928 when Trinity assumed pro-cathedral status. In an announcement issued the following day, the Provost – Canon Catherine Brall – declared that the vote "effectively ends the governance provisions of the Special Resolution which was adopted by Chapter in August, 2008 and ratified by the parish in September, 2008." Just three years ago, the adoption of the Special Resolution drew considerable attention both within and beyond the Diocese of Pittsburgh. Providing some context for how it was adopted, implemented and ultimately revoked seems timely. The author of this report – a member of Chapter when the Special Resolution was first adopted – has consulted with Archbishop Robert Duncan, Bishop Kenneth Price, Canon Brall, all the current members of Chapter (though not all have chosen to respond) and former Chapter member John Campbell, who served until November 2011 and resigned from the Cathedral following repeal of the Special Resolution. A good faith effort has been made to incorporate the competing narratives surrounding recent events, yet it is an underlying premise of the report that the Special Resolution had an inherent merit and that the manner of its demise fell short of the standards to which Trinity had previously been committed. To understand the context of the Special Resolution, it is necessary to go back to the original decision of the Diocese of Pittsburgh to realign in 2007 and 2008. Unlike the Dioceses of San Joaquin, Fort Worth and Quincy – where most of those who chose to remain with The Episcopal Church (TEC) are generally happy with the course pursued by the national church – the process of diocesan realignment in Pittsburgh separated a significant number of clerical conservatives (and their congregations) from the soon-to-be Anglican Church in North America (ACNA). It was in this context that, two months before the second – and final – vote on realignment, the Chapter of Trinity Cathedral debated and adopted the Special Resolution (the text of which, interestingly enough, can still be found on the cathedral website), which was subsequently ratified by the wider parish membership. Canon Brall has stated to me recently that she understands that the word "ratified" was deliberately employed so as to signify approval without any legal change in the character of the by-laws and charter of Trinity Cathedral. To my recollection this was not a fact emphasized to members of the Chapter at the time when the concept of the resolution was put forward by the Provost, formally developed by two members of the Chapter (one a lawyer and future ACNA member; the other the TEC-leaning head of the World Affairs Council) and carefully reflected upon by the whole body, of which the present author was then a member. BE IT FURTHER RESOLVED, that – if circumstances necessitate the application of the principles and provisions of this Special Resolution – the By-Laws governing the parish and Chapter of Trinity Cathedral shall be amended to incorporate these same principles and provisions, and that subsequent amendment of those By-Laws to alter substantively these principles and provisions shall require concurrence by a two-thirds majority of Chapter members elected by Trinity parish and by a two-thirds majority of those parish members present at a special meeting of the parish congregation, duly convened according to the By-Laws. It should be noted that, in the Canon Provost’s understanding, since alterations to the by-laws would have required the consent of the diocesan standing committee at a time when the Diocese of Pittsburgh was headed for division and reorganization into two separate entities, said alteration was impossible. She further notes that she did receive a communication from the TEC Standing Committee stating that they could not acknowledge the Special Resolution. This was not communicated to the Chapter, at least not in the form of a declaration of legal non-recognition. It should not be imagined that the Special Resolution was particularly well received at the time or subsequently, although Canon Brall did receive some expressions of appreciation from persons within and beyond the Diocese of Pittsburgh. Many observers viewed it as an abrogation of responsibility and the reflection of an inability to make hard choices. The fact that Trinity had for more than a decade been limping along financially only added to the conviction that the cathedral was seeking to have its cake and eat it. It cannot be denied that the short-term practical consequences were welcome. Nevertheless, few people in 2008 could have predicted with certainty how the two Dioceses would relate in the long-term. Many had hoped that the relatively even balance of Episcopal and Anglican populations and the presence in the TEC Diocese of a significant body of theologically conservative clergy would promote a spirit of forbearance. The property disputes (for which ACNA must accept a measure of responsibility in choosing to pursue them) and the fact that it seems increasingly clear that conservatives in the TEC Diocese lack the numbers needed to shape such a course have changed all of this. To reduce the perceived failure of the Special Resolution to this level, however, is in part to abrogate the cathedral’s responsibility for clarifying what the Special Resolution was about. "This Resolution shall be publicized to all lay persons and clergy within the existing Diocese of Pittsburgh and to appropriate authorities within The Episcopal Church and the Anglican Communion," read the final clause "with a prayer that – by the grace of God – these principles will serve as a Christian model for reconciliation within divided communities." The Special Resolution was never, as many members of Chapter understood it, about drawing people to Trinity (though obviously any drawn to the congregation by the principles enunciated would have been welcome), and it was never publicly understood as promoting congregational growth, though Canon Brall states that she certainly hoped for such an outcome. To assert that the failure to grow is somehow due to the confusion provoked by the Special Resolution is, in the view of certain Chapter members at least, disingenuous; that failure is entirely separate from the purpose of the Special Resolution and long pre-dated realignment. Where the disjunction arose, at least in the view of the Resolution’s proponents, was in the parish’s failure to communicate to the wider world the principles that were so clearly enunciated in 2008. It should be acknowledged, however, that at the time it did receive coverage in the parish newsletter, the parish and diocesan (undivided) website and in press releases. The tragedy of recent events, however, has been not that Trinity Cathedral has made the decision to align solely with the TEC Diocese of Pittsburgh, but the manner in which that decision was reached, which demonstrated neither "mutual accountability" nor "respect and forbearance." By their action, those who voted to support the December 15 motion inflicted a devastating – and quite unnecessary – blow to the community whom they – quite sincerely – believe themselves to be supporting. During the first half of 2011, members of the Chapter devoted themselves to Kevin Ford’s Transforming Church: Bringing Out the Good to Get to the Great, a book recommended by Canon Brall, as part of ongoing discussions concerning Trinity Cathedral’s long-term strategic plan. Several of those involved found it pertinent to the cathedral’s situation and the discussions around it productive. No indication was given at that time that there was any need to revise the mode of governance under the Special Resolution. In February, however, TEC Presiding Bishop Katherine Jefferts Schori proposed to attend the TEC clergy renewal of vows on April 19 (the Tuesday of Holy Week). Canon Brall states that she received representations not to host the Presiding Bishop in any capacity, but there is also discontinuity of perception in how the calendar clash with the already scheduled ACNA renewal of vows was handled. Canon Brall states that she only inquired of the ACNA diocese whether they could change their schedule, while the ACNA perspective is that an attempt was made to persuade Archbishop Duncan to relocate the ACNA service. The cathedral ultimately hosted a public forum for the Presiding Bishop on the Tuesday evening after the TEC renewal of vows in Wilkinsburg. If the ACNA claim is accurate, given the importance accorded by the Special Resolution to serving both dioceses equally, it was at least unfortunate that the question of moving a pre-scheduled ACNA event was even raised. It should also be noted, however, that the Canon Provost made inquiries of ACNA about hosting this year's ACNA diaconal ordinations – which did not occur the previous year owing to an untypical morning wedding – but did not learn of the ACNA diocese’s rejection until she read the public announcement that they would take place at Church of the Ascension. At the April Chapter meeting, the Canon Provost solicited feedback from members as to the qualities desired in the new TEC Bishop to be elected in 2012, which included "a reconciler," "one who accepts the Special Resolution," and "Biblical and Prayer Book perspective rather than civil law." According to the Canon Provost, the latter two suggestions came from self-identified Anglicans. At the May Chapter meeting, interim TEC Bishop Price, while declaring that he and Archbishop Duncan were working well together, noted that some in the Episcopal Diocese were wondering how a new Bishop might react to the Special Resolution. When later asked why Calvary Church had been chosen for the consecration, he responded that although logistical considerations were a factor there was also a belief in some quarters that it should take place "in a facility solely dedicated to the Episcopal Church." Apparently this elicited both "comment and concern" among some of those present. Bishop Price, it should be noted, informs me that the Chapter minutes exaggerate the importance of the latter concern and that "the relative size of the two buildings was the driving force." At the June Chapter meeting, according to Chapter minutes, "the issue of the Cathedral’s status with both dioceses was raised." According to Mary Thompson, this came in the form of a statement from Canon Brall at the end of the meeting: "I think the Special Resolution no longer serves the best interests of the Cathedral," rapidly followed by adjournment of the meeting. The Chapter minutes summarize the Special Resolution as intended to "(1) bring people together and engender kindness between ACNA and TEC and (2) draw people to the Cathedral who didn’t want to choose between the two." Reference to the original resolution will of course demonstrate that the second was never an overt object, while the first utterly fails to convey the theological underpinning behind the Special Resolution. With such misunderstanding (at best) even on the representative body of the cathedral, it is perhaps no wonder that people were so easily persuaded to dispense with the Resolution. The assertion was also made that both dioceses were increasingly making the choice not to use the cathedral for diocesan-wide events. It was ultimately agreed that both dioceses need to be approached to find out whether, or indeed if, they viewed the cathedral as integral to their future. At the August Chapter meeting, reports from discussions with both bishops suggested that neither viewed the status quo as defined by the Special Resolution to be viable. Archbishop Duncan has stated that his view has always been that the Special Resolution functioned well with regard to Chapter and the relationship between the two dioceses, but not as regards the congregation. From this conclusion developed his proposal for what he termed "Phase Two" of the Special Resolution: an evening congregation serving the ACNA members of the parish that would complement a morning service that might either be specifically for TEC or continue the present arrangement. Bishop Price notes that in his meeting he simply restated the fact that the Special Resolution had not helped Trinity to grow. Members of Chapter requested clarification of the statement from the TEC Diocese that the cathedral did not fit in with its mission, but also recommended that both sides be asked to clarify their view of the cathedral’s legal status and that more effective ways be defined to serve both dioceses. Consideration also began of a white paper – prepared by the Canon Provost – discussing future options for Trinity. According to the Canon Brall’s recollection, the structural deficiencies of the first draft of the white paper in large measure reflected the fact that no one on the executive committee had followed through on its commitment to produce a white paper, forcing her to write one at short notice. While a September 15 report of the executive committee listed exclusive affiliation with ACNA as an option, the first draft of the white paper – presented at the October Chapter meeting – did not. Instead, it worried the existing good relationship with Bishop Price might not carry over to his successor if the Special Resolution endured. It argued that the Resolution had failed to be an agent of reconciliation, that working with both dioceses consumed precious time and energy, and held out the possibility of the TEC diocesan offices relocating to Trinity to provide needed rental income. In passing, it should be noted that the white paper contained a seemingly unnecessary swipe at the "Anglicans" for moving away from the "Downtown community and the homeless" to the North Shore, despite the fact that the principal congregation of and for the homeless in the neighborhood – with whom the cathedral has worked – is an ACNA one. 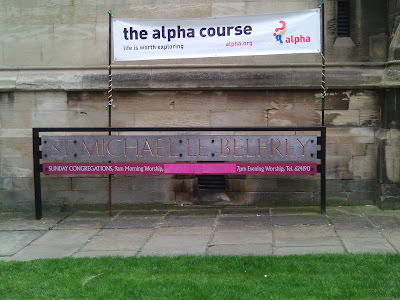 However, Michael Caligiuri has asked me to convey that he believes this to have arisen from a remark he made earlier that an evening ACNA service designed to attract young adults might have difficulty relating to the homeless population that Trinity continues to serve, a remark that he would also have made of a TEC service catering to a similar demographic. The essential conservatism of the TEC Diocese was a constant refrain of the white paper, together with the dubious assurance that Trinity would remain "open and welcoming," that a Sunday ACNA evening service was an option – even without the Resolution – and that ACNA clergy could still marry their parishioners at Trinity. It is noteworthy that the Canon Provost made it clear at the November meeting of Chapter that the white paper was for Chapter review only and would not be shared with the wider congregation, an indication, perhaps, that it was not envisaged that the latter would not be involved in the decision to end the Special Resolution. (She is today not sure whether or not she envisaged that a white paper would ultimately be distributed to the congregation). Discussion and significant amendment of the white paper continued through the fall, but with clear indications that the Chapter remained internally divided. Only at the October and November meetings was the white paper fully discussed by the whole Chapter. Following the December meeting of the executive committee, it was the impression of many members of Chapter, including two members of the executive committee, that debate on the white paper had been postponed indefinitely, that the cathedral would continue to operate under the Special Resolution for the foreseeable future, and that December’s Chapter meeting would concern itself solely with the cathedral’s Strategic Plan. In private, however, several people were pushing for a motion similar to that ultimately presented on December 15. Walt Adkins – whose comprehensive notes on the subject have been gratefully received – offers perhaps the most useful perspective on the anti-Special Resolution position. As one who has responsibility for buildings and grounds Mr. Adkins has perhaps a more acute sense of structural atrophy than most people. In his view, it was the failure of the two Dioceses to leave their disagreements at the doors of Trinity and focus on a joint program of worship, music and service that celebrated the best of ACNA and TEC that was to blame for the failure of the Special Resolution, not a lack of communication on the part of the "small remnant" that constituted the Trinity congregation. His own observation of certain comments by ACNA members of Chapter (most notably the phrase, "sleeping with the enemy") only confirmed him in the belief that, after months of fruitless debate, "the November Chapter meeting had brought the Special Resolution to its end" and that "any serious participant of the November meeting had heard me declare the [Special Resolution] dead." Postponing its demise would simply have compounded the error. Regular business was conducted in a noticeably perfunctory matter. The final item of business – entitled "white paper/strategic plan" – was announced and Canon Brall reported the executive committee’s recommendation that Chapter focus on strengthening Trinity’s role as a cathedral and address the white paper at a later date. Even before any discussion on this recommendation could be entertained, Trinity representative Andrew Thiros requested that, since he believed that any discussion must center around the corporate charter, he be allowed to propose a motion reaffirming Trinity’s charter, which was seconded by appointed by TEC clergy representative Scott Quinn. Officially the TEC position was that the property section of the Special Resolution was not considered by TEC to be in effect. At no point did Mr. Thiros discuss the implications for the Special Resolution; that had to be articulated by others. It is the opinion of Walt Adkins that Mr. Thiros has made observations to this effect – though not in the form of a motion – on at least two previous occasions. Bishop Price concurs, noting that while he did not know the form of the motion that was presented in advance, he anticipated that something of the sort would occur after the November meeting. Despite objections from the secretary, Bette Salmon, that the motion was not on the agenda and should therefore only be discussed and voted upon at the next meeting, Canon Brall allowed it to be presented. Under questioning, Mr. Thiros maintained that adherence to the Charter superseded the Special Resolution and stated that his decision to present the motion had been made two days previously and after discussion with certain members of Chapter. Despite the fact that the executive committee had met just 30 minutes earlier, no hint had been conveyed to at least two of its members, including the secretary. Moreover, no response was forthcoming either from Canon Brall or the chair of the executive committee (the senior warden), Dorothy Amis, as to why other members of the executive committee were kept in the dark. The Canon Provost has stated that she knew that a motion might be put forward but had no specific knowledge of the form – "I don’t know," she says, "who was involved in talking about this." A noteworthy aspect of this selective knowledge is the experience of Chapter member Bill Kaiser, who was told by the husband (not a member of Chapter) of the chair of the executive committee some days prior to the meeting that he hoped Mr. Kaiser would vote in favor of TEC, without specifying what he meant. Not only was there no prior notice of the motion, but no copies of the motion (or of the Special Resolution and the relevant sections of the charter) were distributed at any stage of the proceedings. Executive committee member Wicks Stephens, like Mr. Thiros an attorney, who also received no advance warning of the motion, warned that the intent of the motion was to end the Special Resolution and he considered the manner of its introduction to be underhanded. Following discussion, Mr. Stephens made a motion to table the reaffirmation of the charter, which failed. According to Michael Caligiuri, however, this motion was to table until April, "an impossibly long time frame to have this motion hanging over us" (on this point, the author doesn't necessarily disagree). So bad had the atmosphere become that ACNA clergy representative John Cruikshank (who has close family ties to Trinity) then introduced a motion of no confidence in the Canon Provost, which was conducted with the latter still in the chair. The Canon Provost states that she appealed to Bishop Price as to how to proceed, and he responded that she should simply entertain a voice vote. While the motion was subsequently reported to have failed, some of those present are of the opinion that it sounded equal. By the same token, no one requested that a written ballot be taken, which any Chapter member was certainly free to do. Debate lasted from approximately 5:50 PM until 7:25 PM, and from 6:00 PM onwards the burden of the debate appears to have been borne by the supporters of Special Resolution, including Mary Thompson, a member of the cathedral congregation, whose husband Laurie has been assisting clergy at Trinity. Both are ACNA supporters who agreed to work with the Special Resolution somewhat against their better judgment at first and, in so doing, discovered something of value. They were and are especially disturbed to see the theological principles underpinning the Special Resolution being sacrificed to expediency. Furthermore, in the opinion of Sharon Johnston at least, "questions of legality, procedure or appropriate professionalism were not sufficiently addressed," with the mood of the majority being more along the lines of "let’s put this to bed." Jesus calls us to serve people, not dioceses, and I believe that the Special Resolution was making it progressively more difficult to do that . . . I knew this was an unsustainable situation when Archbishop Duncan told the Executive Committee that he was asking Anglicans ready to leave the cathedral to stay. When someone needs to be asked to stay, there's definitely a problem. If, as time progresses, it's clear to me that being a cathedral interferes with our ability to serve the people, I'll vote then to stop being a cathedral. I believe our calling to serve the least of our brothers is far greater than to serve Bishops and Archbishops. Finally, and only after she had asked how leaders willing to act in such a fashion could be trusted in the future, Bette Salmon finally called the question, recognizing that debate could not continue indefinitely. The motion to reaffirm the charter of Trinity Cathedral was put and passed by 11 votes to 7 (Canon Brall notes that it actually should have been recorded as 12-7, since Bishop Price voted in favor and has the right to exercise a vote under the charter). No reason was given at the time for why the vote should not be two-thirds (in accordance with the Special Resolution) rather than a simple majority, although as reported above the TEC position is that Special Resolution carried no binding legal authority. Unusually, since there are frequent absences by non-congregational representatives on both sides, all the TEC members of the Chapter were present while three from ACNA – Archbishop Duncan, Donald Bushyager and William Lytle – were not. In a final irony, the listed agenda item was never discussed. Bishop Price insists that he had had no advance notice of the vote (and the Canon Provost confirmed that she had not alerted either Bishop to what was planned, in itself a remarkable admission) and noted that he delayed offering an opinion in the hope that Archbishop Duncan – who was delayed – would ultimately make it to the meeting. Several observers maintain, however, that in the course of his remarks he shifted from conciliatory language about the need for the dioceses to work together to one of stating that the Special Resolution had been "accepted but not approved" by the TEC diocesan standing committee, that he was the "only ecclesiastical authority" present and that it was his responsibility to "enforce" the charter. According to one witness, he also declared the Special Resolution to be "illegal." For the last three years, of course, he and his Diocese have been complicit in the illegality, by accepting a half-assessment and electing representatives in accordance with the Special Resolution, although Bishop Price argues that such actions were courtesies, in the latter case observed by Diocesan Convention at his request, and not an act of complicity. While the long-term implications of the December 15 Chapter meeting remain to be seen, it is plain from this account that the Canon Provost’s letter of December 16 is an inadequate summary of what occurred. While the decision may not have been made "lightly" it was certainly made "hastily," and may well have been of dubious legality (the fact that the secretary had no advance notice is a matter of note). Furthermore, the Chapter had indeed achieved a "consensus," namely to put off a decision on the final status of the cathedral in favor of working on the congregation’s strategic goals. When I was newly elected to the Cathedral Chapter, Canon Brall sat me down in her office and we reviewed a document she had prepared outlining her expectations for Chapter members. One of the items that she felt was essential to Chapter participation was the ability to reach a consensus. She remarked that the contentious years prior to her tenure were marked by battles between factions resulting in winners and losers, and that she sought to end that behavior through a process of consensus building around the issues at hand. Throughout my time on Chapter, this model was successful. I cannot remember any Chapter vote in which there was more than one or two negative votes or abstentions. Indeed, the process of the composition and approval of the Special Resolution was in itself an ideal model of consensus building. As Mr. Campbell remarks later, "the Special Resolution was working about as well as it could be expected to." It would never be perfect nor could we expect either or both dioceses always to work with it as we wished; rather it might grow and change and the option to repeal was always there if that was the overwhelming desire of those involved. Furthermore, there was a clear impression – verbally, if not in writing – given in 2008 that this was not for the Chapter alone but for the congregation to decide. The failure to keep that intent uppermost is alarming. In the final analysis, certain members of Trinity’s leadership decided to return to the political methods that were in vogue before Canon Brall took charge of the cathedral, pushing through a decision by stealth which could easily have been obtained simply by following the provisions of the Special Resolution in securing its termination. As it is, the congregation has now been deprived of the right to decide for itself with which body to affiliate – or indeed whether to continue with the Special Resolution – a right accorded every other congregation in 2008. More importantly, the Chapter has now set a precedent for how business will be conducted in the future. There has been remarkably little effort made since the vote by those who voted for the measure to provide pastoral care for those whom they must have known would be hurt by the decision. Indeed there seems to be a total inability to understand what was wrong not with the choice but with the process by which the choice was made. The tragedy here is not that the Anglican Church in America lost a cathedral, but that the cathedral family lost its very raison d’être.